Chris D’Elia takes comedy to global proportions with a successful television show and brand new tour. Chris D’Elia may be a relatively new name to some, but he’s been a fixture in the comedy scene for years. The long-haired, scruffy stand-up comedian has produced side-splitting laughs on his Comedy Central and Showtime specials, even co-starred on the short-lived NBC sitcom Whitney. Most recently D’Elia has appeared in Undateable, a new NBC sitcom about a group of misguided friends, which was renewed for a second season. When he’s not acting, D’Elia remains loyal to his stand-up craft, performing regularly around the country, including an August stop in Camden alongside Sarah Silverman and Louis C.K. at the annual Oddball Festival. This month he’ll bring his Under No Influence tour to the Borgata Sept. 19. D’Elia spoke with us during a break in the action to discuss comedy in his 30s, the camaraderie amongst comedians and why Twitter is a very necessary evil. 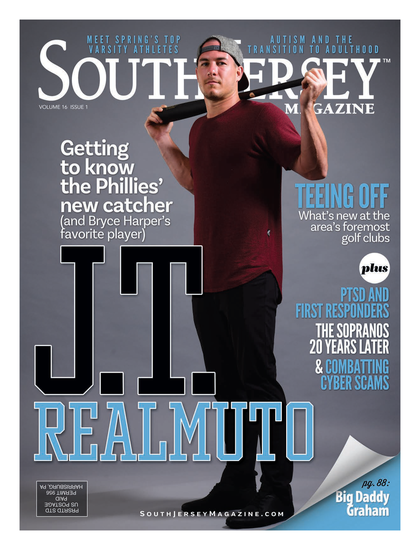 SOUTH JERSEY MAGAZINE: What’s the new tour about, what’s in store for the audience? CHRIS D’ELIA: I don’t know if I would say more mature... but it’s me now in this part of my life. I’m in my 30s, and so it’s what 30-year-olds deal with. SJM: What makes this tour different than the last one? CD: It’s bigger. It’s a theater tour. I’m doing way more cities. This is the first real official tour for me. The last tour I just did tour dates, and then I shot my special White Male Black Comic, but this is a tour that I put together. SJM: Where does the name Under No Influence come from? CD: My brother thought of it actually. We were spitting around names, and we liked it. It was just me doing what I thought and not what anyone else thinks. And then what it was meant was a cool thing for people who really know me or who are fans that really know a lot about me is that although it seems like I’m on drugs when I’m on stage, I never do that. I [also] don’t drink. So it’s just me and how I feel under no influence. SJM: You took the stage recently in Camden during the Oddball Comedy Tour. Tell me about the dynamic of that tour. CD: It’s really cool to be a part of it. It’s a lot of really great comedians. It’s so cool that they even asked me to do it. But its huge venues, 16,000- or 18,000-seat venues. It’s a festival; and it’s really fun. SJM: So what’s the relationship like between comedians on the tour? CD: It’s great. After you get to a certain level of success, people don’t feel so competitive anymore because we all fell into our groove of things, and we are now who we are, and we’re just happy with it. SJM: So right now, you’re working on a show, Undateable, with another group of comedians. What’s the collaboration process like for the show? CD: The writers write the show, and then we put it on the sheet. In order to do that we just let our personalities and characters feel it out, and the writers are really cool with us adding stuff and ad-libbing. It’s a real collaboration, and it’s really great. And we perform in front of a live studio audience. SJM: It just got picked up for a second season. Are there any big changes you’re excited to see or viewers should be excited to see? CD: I don’t know yet. We just got picked up, so I don’t really know what’s going to happen. But it should be cool. SJM: We spoke to Moorestown native and the show’s creator Bill Lawrence a few days before the show first aired, and he talked about the struggles of gaining a TV audience. Have you felt the show struggling to gain TV followers or are you happy with the success? CD: You can catch our show on Hulu or different outlets anyway, so if Internet users really want to see it, they can look it up. I know a lot of people that are watching the first season now online. So I think TV is going through a transitional period where you can watch it on TV; you can watch it online; you can watch it on your computer... I think it’s tough for any television show, especially on network TV, to find a following, but if it’s good, it finds it. SJM: What are the biggest differences for you in doing scripted television comedy versus stand-up comedy? Do you prefer one or the other? CD: I always prefer doing stand-up. Whenever I would do a show, whenever I was on Whitney or any show, I would still go on stage that night. I couldn’t wait to get up on stage. It’s just what I do and who I am. With acting, you rely on other people, but when it’s just you doing stand-up, it’s just you. That’s why I like it. It’s your fault if you fail, and if you don’t, and you succeed, it’s still all you. SJM: Your social media accounts garner a lot of attention. How have you used social media to define your image? CD: If I have a thought, and I think “Oh I shouldn’t tweet that,” I make sure to do it. I want to make sure that if I think it, that’s me, and if I put it out there, the only person who will like it is a person who truly subscribes to me and likes me. And if you don’t like it, then I want you to unfollow me and not be a part of me. But, that being said, I just do what I think is funny. If it comes to me, it comes to me, and I’ll say it. I don’t want to force it. It’s just another outlet. It’s another way of having an audience. SJM: Do you think social media is an important part of being a modern comedian? CD: For me, I love having an audience, but you kind of have to. You kind of can’t be a successful comedian now coming up and not have a Twitter. I have over a hundred times more people that check my tweets and Vines and Instagrams than go to my website. So, yeah absolutely. SJM: What’s the best advice you’d offer aspiring comedians? CD: When people come up to me, they’ll ask what to do, and I just say there’s nothing to tell you except get on stage every single day at least once. Otherwise, someone else will take your space and they’ll become successful. Published (and copyrighted) in South Jersey Magazine, Volume 11, Issue 6 September, 2014).